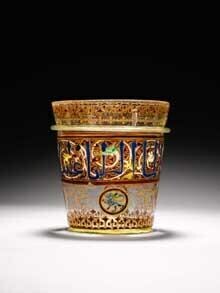 A 650-year-old decorated glass bucket from Syria or Egypt sold for 1.55 million pounds ($2.2 million) at auction on Wednesday, around double the pre-sale estimate and 20 times what the same item fetched in 2000. The bucket is actually a glass finger bowl, intricately gilded and decorated with colourful enamels, that dates from 14th century Egypt or Syria. It was made during the Mamluk dynasty that ruled the region from 1250 to 1517. Passed around during meals attended by the dynasty's elite, an inscription on it reads: "I am a toy for the fingers shaped as a vessel. I contain cool water." The last time the bucket was sold nine years ago it raised 75,000 pounds at Christie's when it was believed to have been made in France in the second half of the 19th century. Only four other similar buckets are known to exist and three of them are in major museum collections in Cairo, Lisbon and Kassel, Germany. The location of the fourth bucket is unknown. Despite the price paid for the medieval glass vessel at Sotheby's, it fell well short of recent Islamic auction highlights. In October, a 1,000-year-old carved rock crystal ewer fetched 3.2 million pounds, and in April last year a 12th century key to the Kaaba in Mecca, Saudi Arabia, the holiest site in Islam, sold for 9.2 million pounds, then a record for an Islamic work of art at auction.